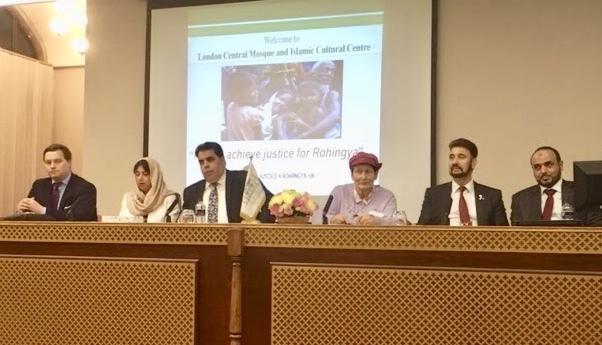 Justice 4 Rohingya UK organised an event entitled "How to Achieve Justice for Rohingyas" which was held at The Islamic Cultural Centre, London on Wednesday, 24th of October 2018. 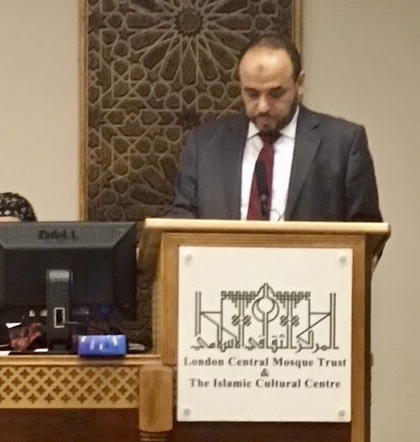 While opening the event, Dr. Ahmad al-Dubayan, the Director General of the Islamic Cultural Centre & London Central Mosque Trust, said, "The subject we are going to talk about today is very very important. First of all it's a human issue; it is also a human tragedy which really started long long time ago; that is the crisis or the tragedy of the modern Rohingya of Myanmar." Recollecting his memory, Dr. al-Dubayan said, "I remember when I was even student in the University early 1980's they took us on our visit to India and Bangladesh. That time they planned for us to see in Bangladesh itself. They took us towards south going to Coxes' Bazaar and Chittagong and in those days we saw the early refugees of Rohingya on the road in Bangladesh." "I still remember how awful and how really sad that tragedy that we saw at that time and what is really bothering me around the world now is that the tragedy is still continuing and still going on after all these years." Dr. al-Dubayan mentioned, "We are now in the 21st century and many minorities in many countries with democracy there. Time is now to bring this issue of the Muslims of Rohingya in Myanmar and to bring it, not only to do more relief works, to do more relief initiatives, but also to bring justice to them. That's why we have this organisation, Justice 4 Rohingya UK." "If this justice does not or is not initiated and started in the UK I don't think it would be to start anywhere in the world. UK is very important country which is well known for the voices; the voice of law is very loudly heard by everybody," said Dr. al-Dubayan and added, "This tragedy really reminds us about the tragedy of the Muslims during the 1990's of Bosnia tragedy; of the Jews during the days of Holocaust in the 1930's in Germany and in the early 1940's. All these things must be stopped and voices must be raised loudly against all these atrocities going and happening around the world." Dr. al-Dubayan also emphasized by saying, "Voices must be loudly raised for more human rights, for more rights for these refugees of Myanmar. We are here together today to support really this issue and to extend our hands either with the nations or with human rights organisations or with any other initiatives. It is really something human where all people should come together, not only Muslims, but also other people who are not Muslims and also everybody who believes in justice and believes in equality of human race and mankind." The next speaker was parliamentarian Afzal Khan, the MP of Greater Manchester. He is a strong advocate of Rohingya rights. Afzal has visited the Pakistani Refugees camps in Bangladesh and raised the issues of Rohingya Refugees multiple times in Parliament. MP Afzal Khan started addressing the gathering by saying "brothers and sisters, Assalamualaikum, Good evening, Salam Shalom Namaste Sastekar." Khan said, "Can I say, it is wonderful to see actually so many people here from different backgrounds of different faiths. I know the time is short. I am going to say one or two things very quickly and that more or less my good friend Dr. Dubayan has covered the issue and that is for humanity and we also learnt that for so many decades, violence has been going on on Rohingyas. I also have seen the terrible situation which exists there. Winter is round the corner and you and me are going back home and would have the comfort. These people have none of this. This is our duty, whatever way we can, to alleviate this." "You know the United Nations is not the problem. All we need is the weight. It is necessary to raise this issue with the Myanmar government to sort out this problem by accepting Rohingya people as citizens of Myanmar. That's all we need to do. So that they can carry on their lives like anybody else, like rest of the people of the world as they enjoy," he said. Mr. Khan mentioned, "Our government has doing something to help. I think we can do more. Me, Seema Malhotra and many other parliamentarians, we have this opportunity in Parliament to put the pressure on the government. This is one thing; but we also have to do in the UN so that we can do more to carry on doing this." Seema Malhotra is also an MP. She is Shadow Chief Secretary to the Treasury in 2016. Parliamentarian Seema said, "Thank you very much. Assalamualaikum and Good Evening to all. I would say huge thank you to you and Dr Ramzy and to all the management committee of hosting tonight and for keeping this issue high on the agenda. This issue has to be kept high on the parliamentary agenda and on our community agenda. 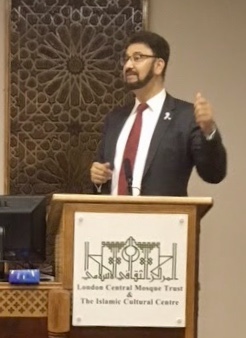 And I am incredibly honest on following my friends and colleagues Afzal Khan MP and others who, I know, have been wanted to come and make to come this evening." She also mentioned, "You know and we know the scale of this tragedy. 700,000 people fled, destruction of their homes and persecutions in the last year. That is an extraordinary number and when you think about the impact of that, not just on that community; what does it have for Burma? What it means for Bangladesh? Picking up those pieces and then the international community needs to response, not just trying to put plaster on these deep wounds." Seema also said, "The United Nations describe them military offensive, The Textbook example of ethnic cleaning and so many still fighting to make for the definition of what is happening. A definition, it should be genocide, in my view, and we should be looking for those who are perpetrators and they should be held accountable in the International Court of Justice." "I want to thank you for tonight events for keeping on the agenda and to focus on those who are suffering day by day that here in our community in London. 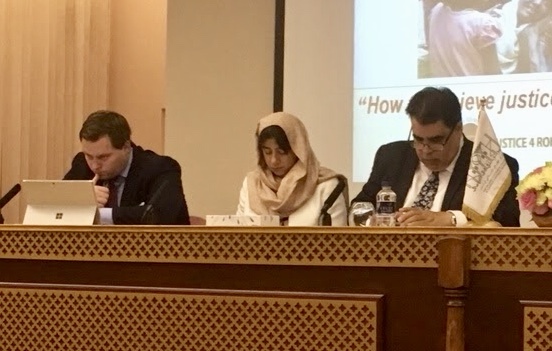 It's helping to keep up community connected with Parliament and help our Parliament active with other Parliaments and with those international courts as well," mentioned parliamentarian Seema. Seema wanted to share a few words that Jeremy Corbyn, the leader of the Opposition Labour Party, has said at Labour Conference recently. She mentioned, "Because I think those spoke of all of us. Sometimes our hopes can be betrayed; many of us campaigned for the release of Aung San Sue Kyi imprisoned by Myanmar military; she was fighting for democracy at that time. We also welcomed her into Parliament; when she spoke and addressed the Houses of Parliament. He went on to say; Myanmar military government with Aung San Sue Kyi normally leads stand accused of these grave atrocities against the Rohingya people. Nearly one million people having fled to neighbouring Bangladesh and women and girls in particular facing appalling violence. That's why we demand that the Myanmar government ends this horrific ethnic cleansing and allow the Rohingya to rebuild their community and their lives. We ask not anything else." "When you think about that number; to me, it is staggering; because when you think about the international aid providing the basic shelter, foods, and medicines; you don't have to do that; going to humanitarian disaster. It is a human-made disaster; man against man. And with a man-made atrocity of this kind, we see so many sufferings; many who should not suffer," said parliamentarian Seema. "They should be able to live their lives in peace and we have to stand up for their return; return when everybody can be living their lives in peace; in peace with each other; in peace with their neighbours and nations; at peace with each other. We have to hold that ideal; because if we don't campaign for that ideal in the work that we do as citizens and in parliament; we will be failing on our part to see. Thank you everybody for coming. I wish you all a very very an important evening in which you all come together," concluded Seema. Ruth Burnett is a Genocide and Holocaust Educator (Jewish Community). Ruth was born in Berlin 1935 and came to England to escape the atrocities at the age of four. For ten years in different foster homes until she was united with her parents; unfortunately that does not went well. Ultimately she was married living here for about sixty years. She has been a teacher, a psychotherapist and has been a writer for 15 years challenging young people to think widely and challenge injustice. Ruth Burnett said, "First of all I want to say thank you for the invitation to come here to speak to you and to hear you of course; thank you for coming to listen. I feel very very honoured to have been invited." Ruth Bernett said, "Now I am concerned about Rohingya ever since I first learnt about that tragedy going on and I think it is absolutely appalling. It is genocide; very few people have the courage to face power with truth and acknowledge it is genocide; because if you want to acknowledge it genocide you are bound by law to intervene. That has also so many problems and leaders are shy of acknowledging genocide and having to intervene. It is not going to come from the top to down; it has got to come from the grassroots bottom on more pressures to get the leaders to take responsibility." "I go back to apathy, indifference and denial which are much more of a problem than racial conflict, than religious conflicts. Conflict can be resolved with talking through; we seem to have lost the ability to distinguish between conflict and war. War resolves nothing end but create more conflict, more aggression and more vengeance," she said. "Every genocide is a huge loss to the whole of humanity. How long we are allowing it to let it go," said Ruth Burnett and mentioned about a website outlining ten stages of every genocide that has been allowed to happen so far. She said, these genocides "not happened but we allow them to happen in stages; the tenth stage is denial; the ninth stage is the slaughter; there are eight clear stages of genocide. When we know it is happening what we say alleged genocide. We have to face the truth, the power that it is genocide to get it stopped. And it has got to come from the mass of people who are at the moment passive bystanders. This is the challenge the children I speak do a tiny bit of move from being a passive bystanders to being an active bystanders," she said. Ruth Burnett also said, "Justice is a word about justice. There are so many concepts; we don't discriminate between them, justice and punishment. In my view, punishment is not justice; it usually revenge; state-organised revenge; in the penal system. I see justice at exposing what has been a crime; and we need to expose the crime of genocide by exposing everyone in order to be able to see that we are now exposing that what is going on as it is now." Robin Marsh is one of the Directors for Justice 4 Rohingya UK. He is also Director for the Universal Peace Federation and he is involved in peace and human rights activities for the last 20 years. He works in various issues in partnership with other groups including conflict and sexual violence conflict and genocide awareness and intra-community cohesion. Rabin Marsh said, "Together with Sheikh Ramzy and number of others we had formed this for last ten or twelve years organising regular events highlighting genocide; genocide issues, stages of genocide; raise awareness and also the responsibility to protect. Many times the Rohingya issue is going on now." "In the past we tried to raise awareness and to counter denial. For what is happening now we have the responsibility; we can work and raise awareness and indirect public opinion and gather evidence. These are things happening now. For example, happening sometimes there is much regret in the world wide community; we can do more. These things are happening now," said Rabin. Rabin also commended Sheikh Ramzy for so passionate about this and "because of his passion he created this organisation For Justice 4 Rohingya UK and we come along to support. We wanted to raise awareness first of all keeping in the public eye and then to raise the issue of accountability by creating the structure by which we can gather evidence. We have to find means and method to have an accountability for what's going on now. If that is becoming obvious we are gathering the evidence of accountability; then, may be, some of the people who are perpetuating this currently would be very nervous about their future. This is why, we come together this evening," mentioned Rabin. Councillor Liaquat Ali MBE JP is a Labour Party member in the constituency of Waltham Forest. He is also chairman of the British Muslim Mayors Association of UK and he was the Mayor of Waltham Forest in 2007-2008. Councillor Ali mentioned that tragic things are happening up there with Rohingya in Myanmar. He said, "I certainly call it a genocide, ethnic cleaning in there and certainly what is happening certainly what happened last year - abuse, violence; villages being burnt down. It's time now that the international community takes some notice and put some pressure on the government of Burma to honour their commitment that they said that these people would be allowed to go back but that was a few months so; nothing happening on that front. I cannot see really anybody that has gone back from the camps that was set up in Bangladesh; it's really important." Councillor Ali also said, "Those people who are responsible for this tragedy should be brought to justice through the international criminal court; I think that could be the way of making sure that these perpetrators who have brutally kicked these people and even the law. Hundreds of people have lost their lives and certainly we, as an international community, should do something on that. United Kingdom government needs to do more but the United Nations and the United States of America need to take some action on this because this is certainly the biggest genocide of this century." Mark Farmaner, Director of Burma Campaign UK and Barrister Michael Pollack also spoke on the occasion.